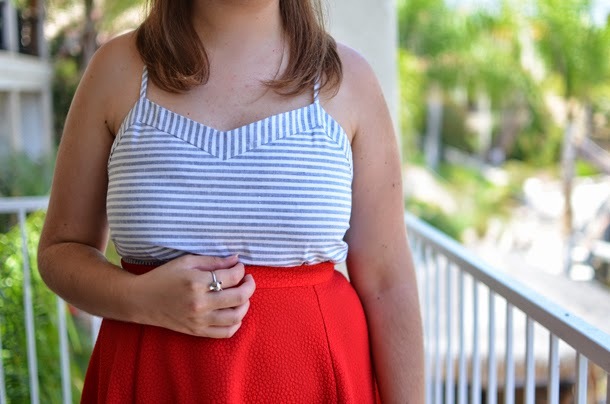 I can't say that I necessarily planned on wearing red, white, and blue for Memorial Day, but I'm not complaining. I picked up almost this entire outfit at Buffalo Exchange over the weekend, and I've already dubbed it my summer uniform. 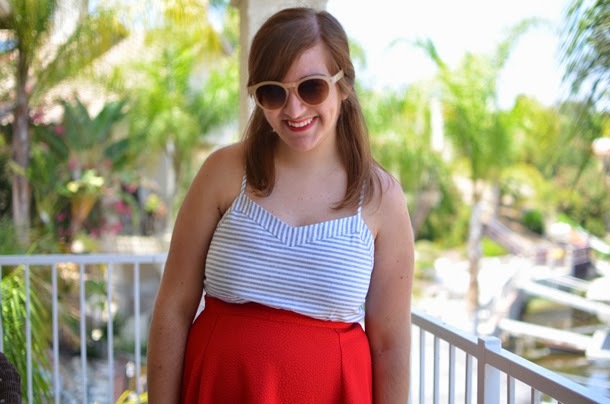 After searching high and low for the perfect red A-line skirt, I'm more than happy to finally have one in my possession, and I'm even happier to have a striped crop top and new sunglasses to go with it. A successful Memorial Day weekend indeed. The rest of the weekend wasn't filled with quite as many cute clothes, but it was pretty great. Since my roommate fell through recently, I met with two girls who I found online on Saturday. I really hit it off with them, and the three of us decided to look for a place together. The apartment search has resumed, and even though it's going to be harder to find a three bedroom (that's also pet friendly for both of their dogs), I'm optimistic. I also got to spent a lot of quality time with my best friend, hang out with my boyfriend, and celebrate my nephew's 5th birthday party. It was Teenage Mutant Ninja Turtle themed, so you know it was good. One of my brothers and his girlfriend also moved back to Orange County last week after living in Arizona for five years, so I got to spend time with them as well. My actual Memorial Day was spent at my parents' house eating ribs and going out on their boat. All of that's not to mention having a three-day weekend in general. I'm not ready to go back to the real world. I hope you all had a great three day weekend as well! I had my first disappointing blogging experience last week, and I'll be sharing my experience in my next post. You've been warned. A perfect summer time look. Love it! I hope you find the perfect apartment! That red skirt is lovely! Wow! What a packed weekend! 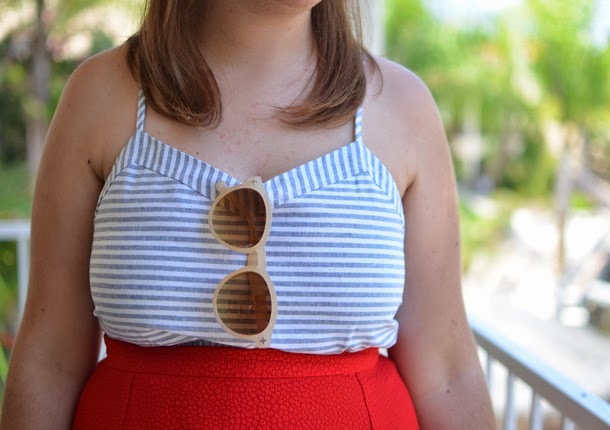 This is a cute outfit that just makes you look so ready for summer fun! So cute! You always seem to come away with the best finds at consignment shops. I long for a Buffalo Exchange around here. Best of luck looking for a place, too. I can't even imagine what that's like in SoCal. Haha, love your cute Memorial Day outfit! Even if it was unintentional (which makes it all the better), I'm loving the classy color combo. Good luck with apartment hunting! I'm absolutely loving this outfit! It's got the perfect summer feeling.